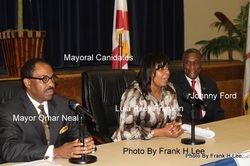 Mayor Neal is the current Mayor of Tuskegee, Alabama. He is also host and founder of the "You Got the Power" Syndicated Radio program. Lula Riley is the former Administrative Assistant in the Tuskegee Municipal government. She is also the owner of several Macon County businesses. Hon. Johnny L. Ford became the first black Mayor of Tuskegee in 1972. He held that office for 26 years. He then was elected tot he Alabama State Legislature as a Representative. He is also founder of the World Council of Mayors. Rev. Thornton is the spiritual leader of the Divine Inispiration Ministries in Tuskegee, AL. Hon. W.C. Anderson is the current Chairman for the Utilities Board of Tuskegee, AL. Mrs. Goode is a member of the Tuskegee Clean City Committee. Hon. Harold Washington is the current Vice Chairman of the Utilities Board Place 2. He is the owner of the H & J Family Foods grocery in Tuskegee, AL. Angela Hamilton is Clerk for the City of Tuskegee, AL. Lawrence Haygood, Jr. is the former President of Tuskegee's Southern Community College. He is currently the Business Development Specialist for the Tuskegee-Macon County Community Development Corporation. Shirley Curry is a Tuskegee University staff member and the wife of former Tuskegee Fire Chief Curry. Hon. Mae Doris Williams is a retired principal for the Macon County School District, and the current At-Large Tuskegee City Councilman. Hon. Ronald D. Williams, Sr. is the former Mayor of Tuskegee, AL. Prior to becoming Mayor Williams was the Mayor Pro-Tem of Tuskegee. Frank Lee seeks the position of Tuskegee City Councilman in District 1. This includes the Greenwood and Tuskegee University communities. 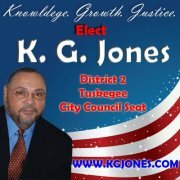 Cephas Holmes is on the City of Tuskegee Zoning Board. Brooke is a graduate of Tuskegee University. Hon. Lateefah Muhammed is a local attorney in Tuskegee. She is former Tuskegee District #1 Councilman. Rev. Kenneth G. Jones is the pastor for Tuskegee's Bethel Baptist Church. He is also with the Habitat for Humanity and the Macon County Ministerial Food Bank. Mrs. Whitehead is the owner of Ala's Unique Gift Shop in Tuskegee. She is the wife of Sarge Whitehead, retired educator and Victoryland's Executive. Satese Henderson is a B.T.W. 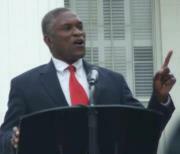 High School graduate and he attended Alabama State University, in Montgomery. Hon. Georgette White-Moon is the current City Councilman for District 3.